Bentar Indah beach located at Gending district, in the side road of Surabaya - Banyuwangi, 7 km from the east to Probolinggo. Bentar Indah beach is the way to Bali - Surabaya - Yogyakarta - Jakarta, so that it is a potential tourism object. There is a hill beside the Bentar Indah beach, because it’s located on the main road curve. So that, the tourist can climbs the hill and enjoy the beautiful of sea scenery. There is white sand that spread along the beach and watch the interesting of sea waves in Bentar beach. The tourists can also fishing, because in the east mangroves forest will be made for traditional dam, which will have fishes and shrimps seed. 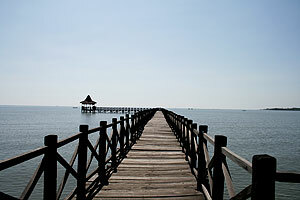 Beside that, the visitor can do the other holiday activities, such as; swimming, boating, sun bathing, volley beach, etc.